Air traffic network-product is a link-knot routing dataset compliant with INSPIRE requirements. It includes f.ex. flight routes and aerodromes. Data shall not be used for operational flight activities or flight planning. FTA INSPIRE Transport Networks Theme Dataset is a dataset depicting the Transport Networks covering the whole of Finland. It contains the following INSPIRE feature types: Road network, Rail network, Waterway network and Air transport network. The elements are updated weekly. 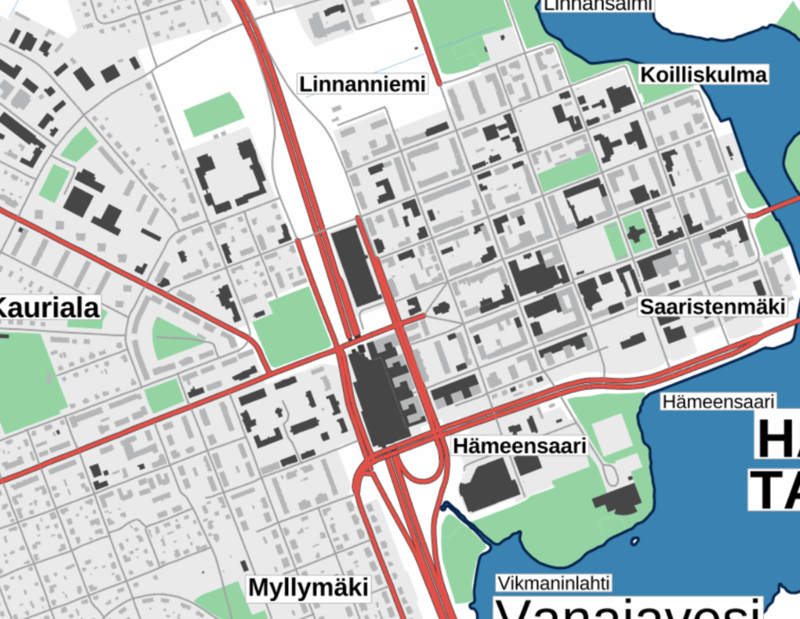 The dataset is based on transport network data from the Finnish Transport Agency and Finavia. The dataset is available via the FTA INSPIRE Download Service (WFS) for Transport Networks and it can be viewed via the FTA INSPIRE View Service (WMS) for Transport Networks. Lorry parking areas at E18 road in Finland. Data is in Esri shapefiles, in ETRS-TM35FIN coordinates. Data is maintained and provided by FTA (Finnish Transport Agency). National Land Survey's Topographic map series in vector format is a dataset depicting the terrain of all of Finland. The most important elements are the road network, administrative borders, preservation areas, population centres, geographic names, waterways, land use and elevation. The largest scale level (1:100,000) of the Topographic map series in vector format is produced by generalising from the Topographic database. Topographic map series 1:250,000 is produced by generalising the dataset 1:100,000. Topographic map series 1:1,000,000 is produced by generalising the dataset 1:250,000. Topographic map series 1:4,500,000 is produced by generalising the dataset 1:1,000,000. The geographic names have been generalised from the geographic names in the Geographic Names Register to map names suited to the scale in question. The administrative borders in the Municipal Division of each scale are used as administrative borders. The Topographic map series in vector format can be used for the production of other map products, e.g. 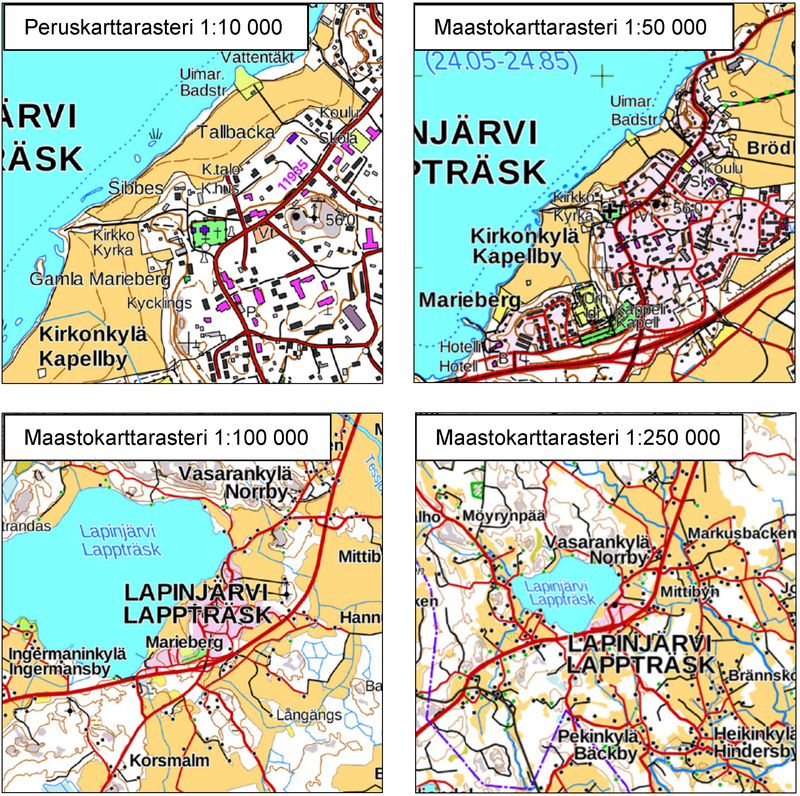 approach maps or maps on a regional or national level The product belongs to the open data of the National Land Survey of Finland. More information: Topographic data and how to acquire it http://www.maanmittauslaitos.fi/en/maps-and-spatial-data/expert-users/topographic-data-and-how-acquire-it. The Plain map series is a simple, plain and readable dataset product series in raster format that depicts the whole of Finland. The product is meant to be used as a background map whose character changes to a guide map in large scales. Impaired vision has been taken into account when designing the product. The key objects presented on the map are roads and railways, road names, buildings and constructions, administrative borders, waterways and other geographical names. The road network, public buildings and texts have been especially emphasised. The most usual limitations of colour vision have been taken into account in the use of colours. The product belongs to the open data of the National Land Survey of Finland. More information: Topographic data and how to acquire it http://www.maanmittauslaitos.fi/en/maps-and-spatial-data/expert-users/topographic-data-and-how-acquire-it. The Background map series is a dataset product series in raster format that depicts the whole of Finland and that is meant for web use as a background material for thematic data. Its key objects are road names, roads and railways, buildings and constructions, administrative borders, geographical names, waterways, land use and addresses of buildings (from the Population Register Centre). The product belongs to the open data of the National Land Survey of Finland. More information: Topographic data and how to acquire it http://www.maanmittauslaitos.fi/en/maps-and-spatial-data/expert-users/topographic-data-and-how-acquire-it.